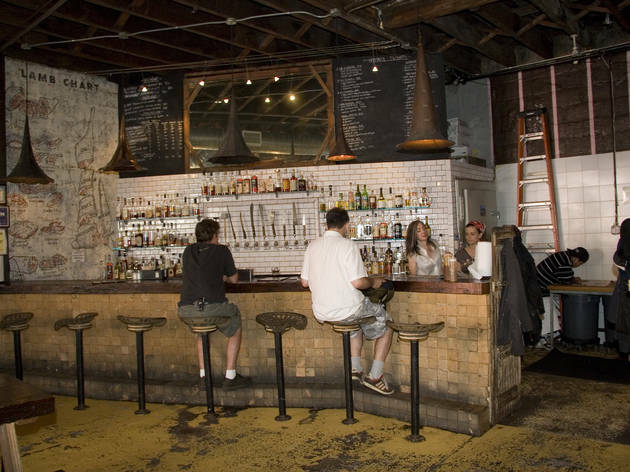 Doubts that Joe and Kim Carroll (Spuyten Duyvil) were serious when they named their Williamsburg barbecue joint Fette Sau, German for “fat pig,” are put to rest at the food counter, where the lightest meat served is charred pork (even chicken has been banished). Any lingering apprehension vanishes at the bar, where beer drinkers can choose from ten brews on tap, offered in gallon-size glass jugs. Such unbutton-the-pants gusto, fervent even by gluttonous barbecue standards, makes Fette Sau great fun. 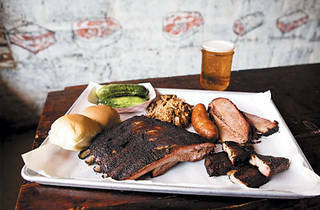 After waiting dutifully in line, patrons order their meats by the pound — glistening mounds heaped onto paper-lined baking trays — before toting their bounty to one of the picnic tables in the former auto body shop. Lean baby back ribs come tender and pink in the middle, the tasty meat carrying a hint of smoke and a light rub of espresso and brown sugar. Thick-crusted pastrami gets caked in a coriander black-pepper rub and gets gets a sweet, fatty coating from the drippings of its ovenmates. Complement your meaty meal with house-made baked beans loaded with burnt-brisket ends, cold broccoli spears, or half-sour pickles and fresh sauerkraut. 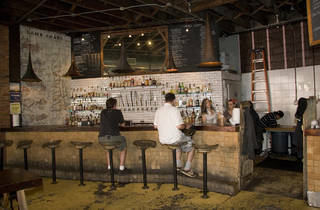 For those who prefer their smoke in a glass, there’s an encyclopedic whiskey and bourbon selection at the bar, which is outfitted with tractor seat stools. 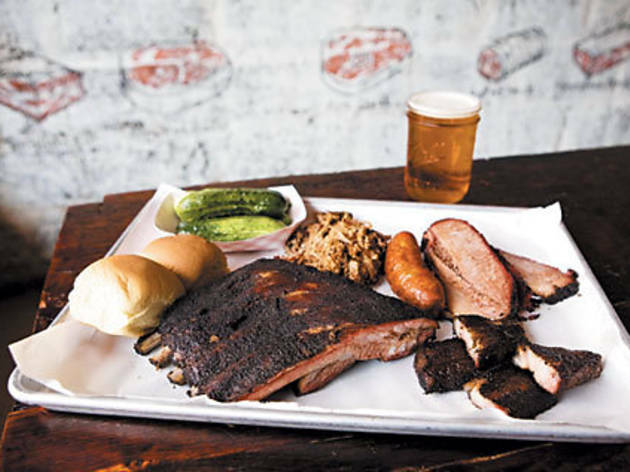 World class BBQ that is easily the best in NYC and holds its own against the South. The thing that most people don't say about this place is its cocktail choices that focus heavily on whiskey. The bartenders are very educated on everything they serve to go with your awesome bbq dinner. For the food this is still my favorite bbq spot in the city. This was my first BBQ experience in NYC and I now have the bug thanks to these guys! I have to say I've been back since and they still rate at the top of the list... Brisket, Beans and Ribs, what more could you need in a big city? If they have the pastrami tongue, get it. I love this place, the food is amazing and the general vibe and atmosphere is on point too.The seating can be a bit of an issue though as you have to go up and get your food before finding a seat so you often find a lot of people have nabbed tables while someone else in the group has gone up to get food, that being said you just have to wander around a bit and then just plonk yourselves down in the first space you see!It is just made all the harder as you’ve got a delicious tray of food in front of you! I love this place. I love the family-style seating, I love the bar stools, I love the "which cut comes from which part of the animal?" wall murals, I even love the long line during which you can make new friends and mull over exactly what to order. I'm never disappointed with my meal, I always have fun and leave sated. BBQ success! Hands down, the BEST barbecue food I've had in the greater tri-state area. When family and friends visit from out of town, I love to introduce them to Fette Sau. You'll never walk out of there hungry or displeased. Be sure to get there right around when it opens to get at the front of the line. There's a reason there's a line - it's fridge GOOD. Love the pork ribs, pulled pork, brisket. Everything ROCKS. Also, order a good IPA to go with it. And be prepared to spend money, because the food ain't cheap! Great BBQ spot in Williamsburg! The vibe is cool and I love coming here in the summer! It's an order at the counter style and sit at a picnic table cafeteria style place. You can order meat by the half pound and I definitely suggest coming hungry! It isn't a place where you can grab a quick or cheap meal - you're definitely paying by the pound here. That being said - everything was hearty - I ordered pork, broccoli and baked beans. The portions are exactly what you ask for. I'm not a huge fan of BBQ, but everything was delicious. I think it's overly hyped up but I do understand why (if you're really into BBQ). I would definitely take out of town friends visiting New York here. It's one of those "cool Brooklyn experiences" but I would go early to avoid the long New York wait that Fette Sau tends to have. Overall, recommend! This is THE most authentic BBQ joint I've found in the city. I love to go here on nights I just want to pig out and have some seriously good beer, which is most nights I suppose. There's often a line out the door to get to the chow line, where you can order brisket, ribs and MEAT MEAT MEAT by the half or full pound, plus biscuits, delicious baked beans with meat ends, awesome potato salad and green beans. I'm salivating thinking about it. You get a draft beer and take your hunk of a meal to the table with you, cafeteria style, and slather the different kinds of BBQ sauce on absolutely everything. I know what I'm having for dinner tonight!